Whoa, this weekend was a scorcher! The mercury shot into triple-digit territory on Sunday, which is truly a rarity in these parts. We only have a couple of days per summer that reach that level of sweaty, and sweat we did. My husband and I were lucky enough to be in Denver that day, lounging around a swanky hotel pool, cold drinks in hand. That’s what I call serendipity! We took a brief break from the pool to watch France lose that heartbreaker of a futbol match to Portugal, but then we spent the rest of the afternoon IN that pool, because it was far too steamy to spend time out of it. We headed back home late in the day, just in time to learn of the scary wildfires blazing through Boulder county. Luckily, the fire isn’t near us at the moment, but my thoughts are with my friends in nearby Nederland, where it’s going strong. Stay safe Nederlanders, and if everyone could cross their fingers and send good juju for those winds to cease and desist, I’d appreciate it. Windy, hot days make it so much harder for our firefighters to work their brave magic. And we need some magic. It was especially distressing to hear that the fire was the fault of human error–these knuckleheads, in particular. It’s fire season, people! Make sure you are responsible about campfires! Argh! Summer’s dog days mean one thing to me: salads for dinner. Lunch, too, for that matter. Who wants to cook on a 100-plus degree day? Not me. Usually, I turn to this salad or this salad in the middle of summer, but I’d seen a salad recipe in a magazine recently that caught my eye. It has taken me many, many years to come around to the idea of incorporating juicy summer fruits in my salads. For some reason, it just sounded beyond weird to do that. 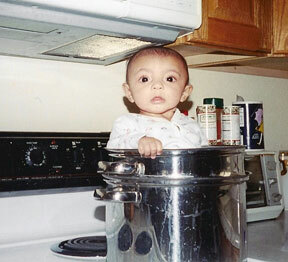 I’m usually a sweet girl or a savory girl–I never thought those flavors would play well together. Well, can I just say that I was dead wrong about that? Forgive me for the error of my ways. Turns out, I love the contrast of sweet and savory in a summer salad. For the last few years I’ve thrown fresh cherries, strawberries, stone fruit and yes, even watermelon in my salads, and they bring so much good flavor to the plate (or bowl). I’d never tried using cantaloupe in salad, though. It’s kind of strange that I never thought to do so, though, because growing up, I watched my Daddy-o dig into big wedges of cantaloupe, which he sprinkled liberally with salt and pepper. The process made me gag a little when I was young, but Daddy insisted that the salt somehow made the cantaloupe taste sweeter. He’s a clever one, that father of mine. Adding a little salt (either directly or in the form of a light dressing) really does make the flavor of the cantaloupe shine. Add in some other elements like salty pork product (yes, please) a good, creamy burrata cheese (Lordy hallelujah, yes), some crunchy cucumber and a kick of chile, and you have an absolutely scrumptious and easy lunch or supper. All you need is a lovely baguette and a nice, cold glass of Pinot Grigio or rose and you are in good eatin’ territory. I could eat this salad several times a week until mid-September and I just might. I think it’s kind of addictive. If you are stringently anti-cantaloupe–and I do know some people who are–I can assure you that honeydew melon would make a brilliant substitute, as would watermelon. Any ripe melon will do. This salad would also be lovely alongside some grilled chicken or fish, if you’re feeling the need for a more substantial dinner. Me, I’m content to gorge on a huge (shamefully huge) bowl of this and call it good. And then I’ll crank up the air conditioning, since I’m not blessed to have a pool in my backyard. Maybe someday. A girl can always dream, right? 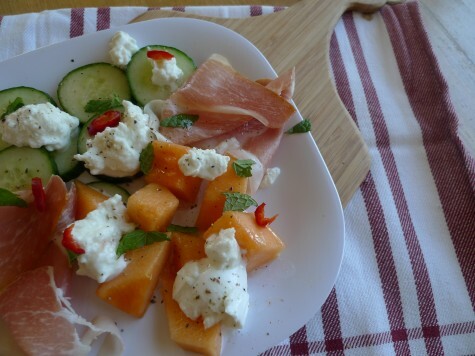 Arrange cucumber, cantaloupe and torn prosciutto on a large platter. Whisk together olive oil and vinegar. Pour over melon and cucumber. Top with burrata and mint. Sprinkle with salt and pepper and chile, if using. We always did the salt/pepper thing on melon – love it. 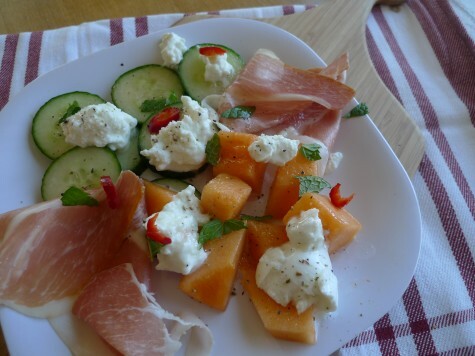 And I love prosciutto with melon. My mom would make that as an appetizer for “fancy” dinner guests. :D Great hot weather eating.